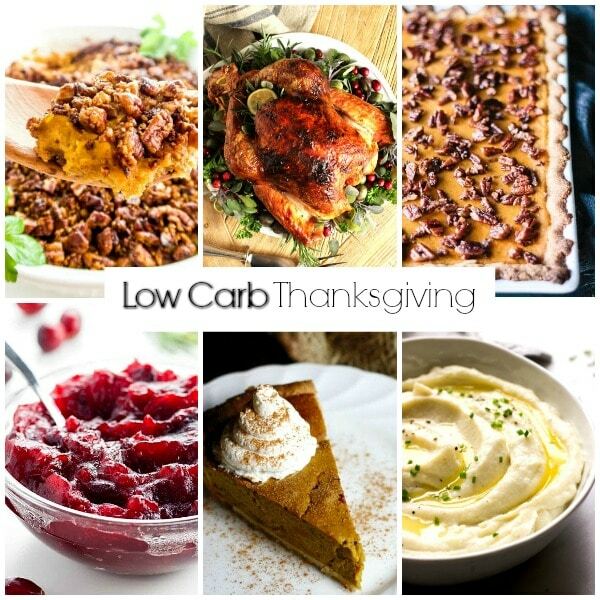 Low Carb Recipes for Thanksgiving - Home. Made. Interest. It’s time to start planning your Thanksgiving menu! For all my low carb and Ketogenic eaters, I made life a bit easier for you by gathering up all the traditional Thanksgiving recipes and finding amazing low carb recipe versions of them. Now you don’t have to miss out on all your Thanksgiving favorites like mashed potatoes, stuffing and gravy, cranberry sauce . You can host a low carb Thanksgiving or make a few low carb recipes for Thanksgiving without feeling like you have missed out on all your favorites. If you’re not hosting Thanksgiving, bring a low carb Thanksgiving recipe with you. Why should you have to be stuck eating turkey and salad while everyone else stuffs themselves? I’d say get your fat pants ready but, you won’t need them with these low carb Thanksgiving recipes! I have broken this list down into 10 traditional Thanksgiving recipe staples: Turkey, Stuffing, Cranberry sauce, Gravy, Rolls & Bisuits, Mashed potatoes, Sweet potato casserole, Green bean casserole and a bonus Low Carb Sides category. Lastly we have dessert, Pumpkin pie and Pecan pie. Now let’s get started with some Low Carb Recipes for Thanksgiving! *I did not calculate the net carbs, I just copied them from the recipes if they were listed. I expressly disclaim any and all liability of any kind with respect to any act or omission wholly or in part in reliance on anything contained on this website. You can’t have Thanksgiving without turkey, right? Personally, I’d take ham over turkey any day but this isn’t about me. It’s about tradition, so low carb turkey it is! Citrus and Herb Butter Roasted Turkey (pictured above)- This beauty is the lazy man’s turkey with no brining involved. No need to plan ahead, just mix up your herb mixture and get to rubbing. This is 6 net carbs per serving. Easy Roasted Turkey with Sage Butter– You get the key to making sure your turkey is moist along with an amazing tasting bird with this recipe. The pan juices make a great gravy too. Use xanthum gum to thicken it. Super Juicy Turkey Baking in a Cheesecloth– Let me start by saying, I have never heard of wrapping a turkey in cheesecloth but OMG it looks delicious. It’s soaked in wine and butter, yes please! Maple Glazed Turkey with Bacon and Sage Butter– Bacon lovers rejoice! This turkey is covered with a layer of bacon. That is basically all you need to know about this one. Sub out the maple syrup with sugar-free maple syrup to make this a low carb recipe. 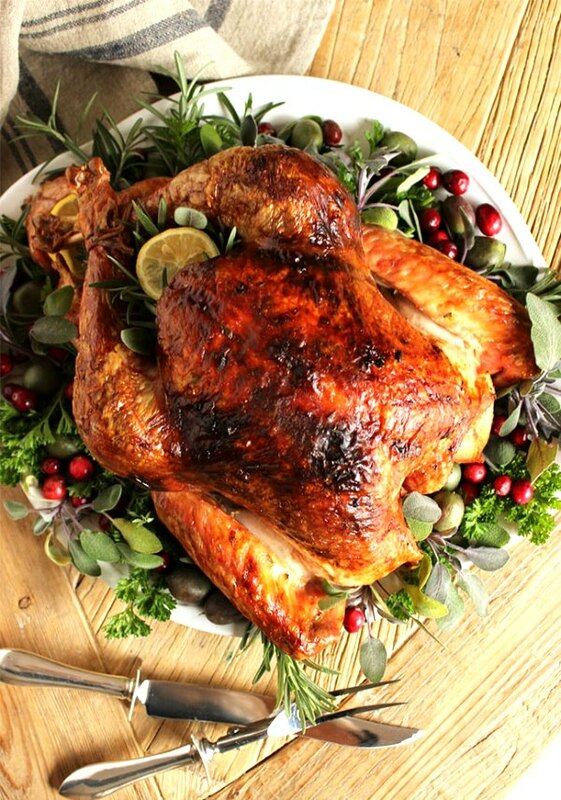 Lemon, Apple and Herb Turkey– In this recipe, brining is critical. For all of my brining critics, this is the recipe for you. She gives you step-by-step instructions. This is 7 net carbs per serving. Some call it dressing, others call it stuffing. I’m an east coast girl and here in Maryland we call it stuffing even if it’s not “stuffed” inside the turkey. Personally I prefer it not to be stuffed. I always find it is too mushy when it’s stuffed inside the turkey. How exciting that now you can enjoy stuffing without all the carbs this Thanksgiving. 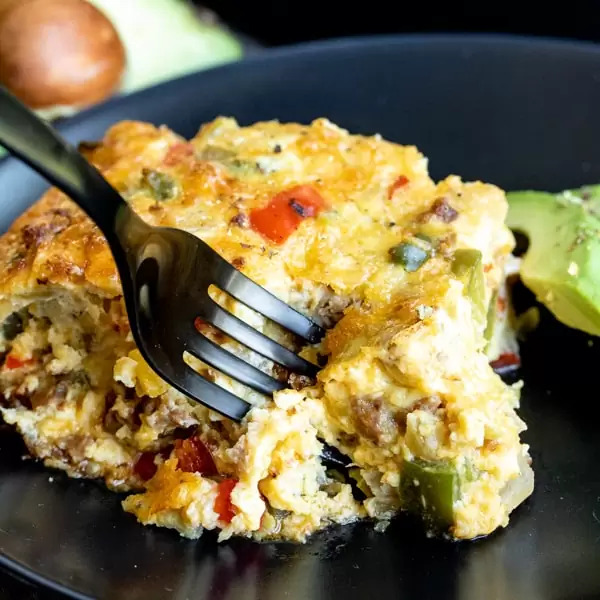 If you cannot live without stuffing, this may be the low carb dish to bring if you’re not hosting. Most of these low carb Thanksgiving stuffing recipes require making a low carb bread ahead of time. So plan ahead! Low Carb Pumpkin Bread, Sausage and Feta Stuffing (pictured above)- Be sure to make the low carb bread at least one day in advance, preferably two, before making the low carb stuffing. This has a cornbread stuffing texture to it. This has 3.5 net carbs per serving. 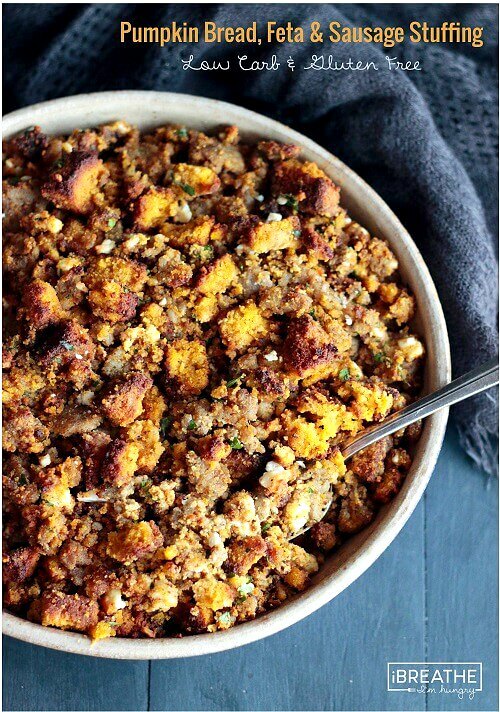 Low Carb Cornbread Stuffing– You can’t get more traditional than this. This low carb cornbread can be made ahead of time and frozen. Not only is this low carb, it is paleo as well. This is 4.4 net carbs per serving. Low Carb Pecan Stuffing– This low carb stuffing has no bread-type ingredient. It consists of pecan, vegetables and herbs. This is 3.4 net carbs per serving. Low Carb Spicy Sausage and Cheddar Stuffing– This is made with a low carb, cheesy, skillet bread. It is recommended to make the skillet bread 1 or 2 days ahead. This is 2 net carbs per serving. Coconut Flour Bread Stuffing– This recipe has an interesting ingredient, diet ginger ale. If you don’t want to use soda, there are a few alternatives. This is 5.4 net carbs per serving. Here is another Thanksgiving tradition, cranberry sauce. We all know that canned cranberry sauce is all cranberries and high fructose corn syrup so that’s out if you’re eating low carb. The solution is to make your very own low carb cranberry sauce. 4-Ingredient Low Carb & Sugar Free Cranberry Sauce (pictured above)- This sugar-free cranberry sauce is so quick to whip up, it only takes 10 minutes to make. This uses erythritol as its sweetener. This is 4 net carbs per serving. 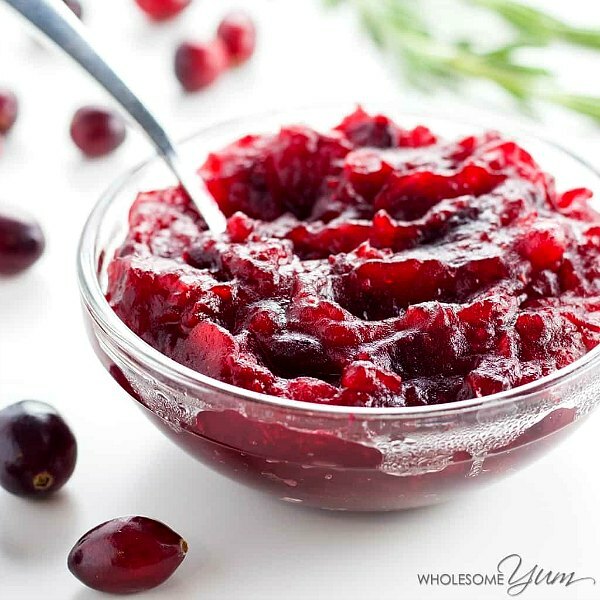 Low Carb and Keto Cranberry Sauce – Loving the special ingredient in this recipe. Fresh ginger juice is used in this sauce. While you have the ginger juice out, make a Moscow mule. This is 3 net carbs per serving. Low Carb Pineapple Cranberry Sauce – This sauce uses xylitol as its sweetener and a dash of orange liqueur. Since this uses frozen pineapple, there are pieces of pineapple in it. Slow Cooker Cranberry Sauce – This simple sauce is made with only 5 ingredients. By making it in the slow cooker, you save on stove top space. Use sugar-free maple syrup for this low carb cranberry sauce. Sugar Free Cranberry Sauce – This low carb cranberry sauce uses 2 sweeteners making it extra sweet tasting. Gravy is a tricky one. Flavor is the utmost importance. Thickness is second in my opinion. My advice, focus on the flavor then worry about thickening. 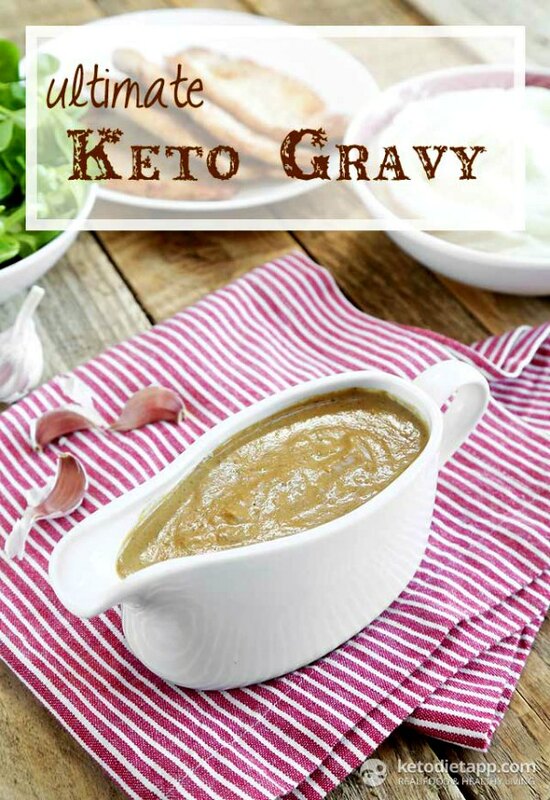 Ultimate Keto Gravy (pictured above)- Make this low carb gravy ahead of time and refrigerate for up to 5 days. This is 4.7 net carbs per serving. Low Carb Gravy Guide– This guide has the in’s and out’s of all things gravy. Turkey Giblet Gravy– This low carb gravy is the closest to the gravy I usually have at Thanksgiving. It is made with a turkey neck and giblets. This is 2 net carbs per serving. Brown Gravy– Made with sour cream. This is 3.5 net carbs per serving. Wild Mushroom Turkey Gravy– French cream reduction to the rescue. This is 2.5 net carbs per serving. Read my lips, you do not have to miss out on eating bread just because you are eating low carb. I’m not going to lie to myself or you. Of course carbs from bread taste amazing! We all know that. Unfortunately some of us cannot consume them or should not. Thankfully there are hundreds of blogger and websites with delicious low carb bread recipes. Keto Biscuits (pictures above)- These biscuits remind me of KFC biscuits. Drooling! This may be the low carb biscuit recipe I’m trying first. This is 3.4 net carbs per biscuit. 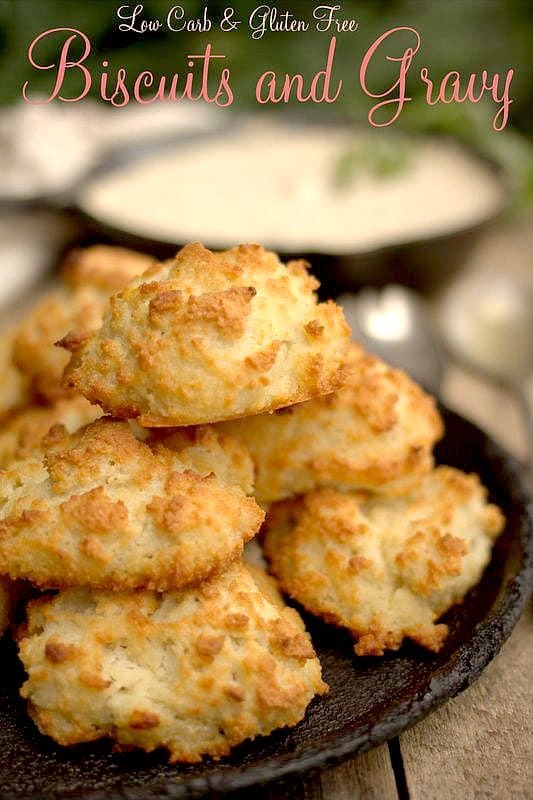 Low Carb Cheese Biscuits– These look like buttermilk biscuits. This low carb recipe uses sour cream and cheddar cheese. This is 2.4 net carbs per biscuit. Savory Rolls– These low carb rolls use almond flour and coconut flour. You have to chill the dough for 1 hour or overnight. This is 4.2 net carbs per biscuit. Low Carb Dinner Rolls– These easy low carb rolls are made with the fathead dough recipe and have a great bread-like texture. This is 2 net carbs per roll. Coconut Flour Dinner Rolls– By using psyllium husk powder in conjunction with coconut flour, you come away with a soft and fluffy low carb bread. This 1.3 net carbs per roll. Potatoes are one of the foods I dearly miss. If you really think about it, they don’t have much flavor. It’s the butter and salt added that make potatoes a superstar and these low carb substitutes for mashed potatoes are full of flavor. Cauliflower Mash with Ricotta and Roasted Garlic (pictured above)- My eyes must be deceiving me. 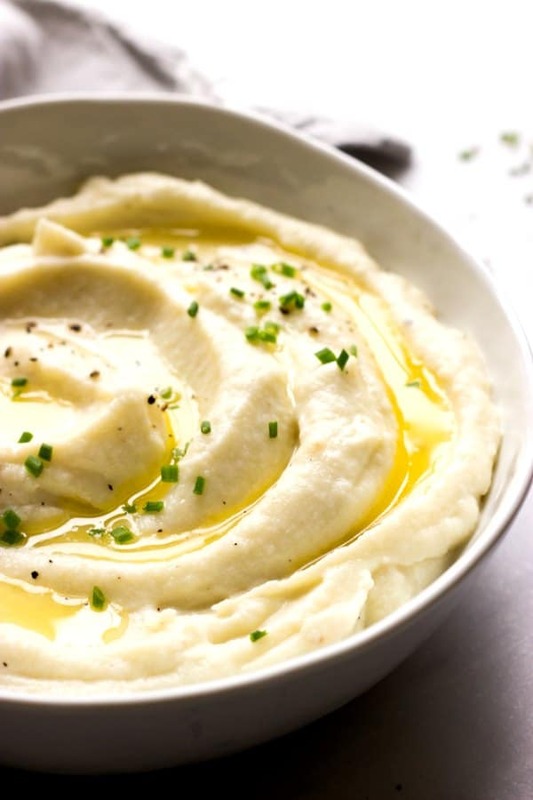 This low carb cauliflower mash looks just like mashed potatoes. Roasted garlic is life changing! Bacon & Smoked Gouda Cauliflower Mash– Bacon and cheese make everything taste great. Smoked gouda is one of my favorite cheeses. This is 6 net carbs per serving. Crockpot Mashed “Faux”tatoes– Loving that these low carb “potatoes” are made in a crockpot. You have to check these out. They are made with purple cauliflower. This 4.8 net carbs per serving. Mashed Cauliflower Loaded with Bacon and Cheddar Cheese– Loaded anything is always good in any way shape or form. This is 4 net carbs per serving. Mashed Cauliflower “Potatoes”– This low carb recipe has a key ingredient that I believe should be in every recipe! This Thanksgiving traditional recipe may be the only reason I show up at Thanksgiving. The smooth sweet potato texture with crunchy candied pecans, topped with gooey marshmallow is my kryptonite. Finding a low carb substitute for marshmallows will be tough! 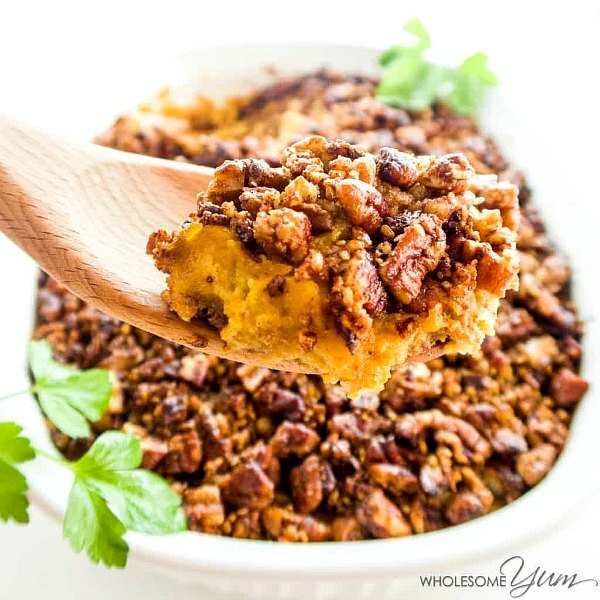 Pecan Roasted Better Than Sweet Potato Casserole (pictured above)- Roasted butternut squash and cauliflower make the perfect low carb substitute for sweet potatoes in this low carb Thanksgiving recipe. This is 10 net carbs per serving. Low Carb Sweet Potato Mash– This low carb pumpkin and cauliflower mix was named Top Diabetes Healthy Holiday Recipe for 2015 by Healthline. This is 6.5 net carbs per serving. Spaghetti Squash with Pumpkin and Parmesan– If you’ve been eating low carb, spaghetti squash is no stranger. Carrot and Turnip Mash– I’m a huge fan of turnips. This recipe has been in her family for years, so it must be a keeper. This is 1 net carb per serving. Pumpkin & Cauliflower Garlic Mash– This recipe was verified and published in Taste of Home. Another recipe with cream cheese. I’m telling you, cream cheese makes every recipe creamy and delicious! This is 7 net carbs per serving. Our last traditional Thanksgiving side has been popular throughout the years for all the holidays. Since I’m not a fan of green beans, I usually pass on this side. But none-the-less, green bean casserole is a Thanksgiving favorite so here goes. 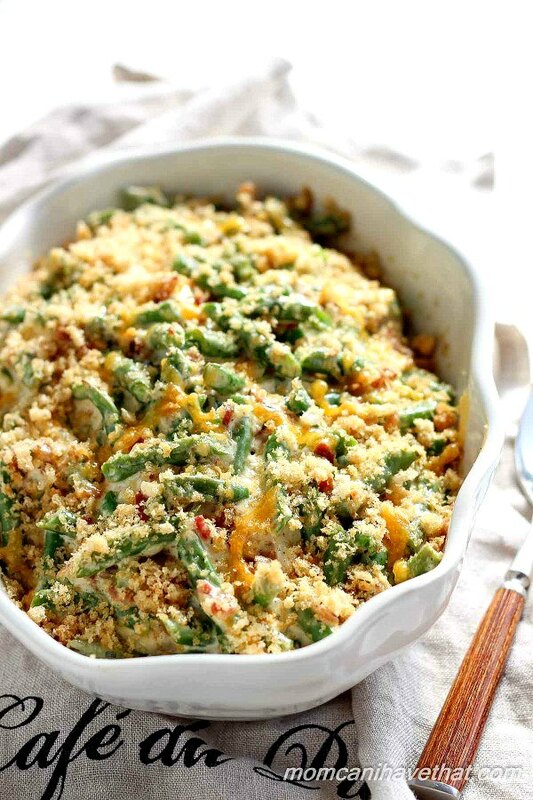 Low Carb Green Bean Casserole (pictured above)- Have you noticed a pattern yet? I may or may not favor anything loaded with bacon and cheese. And you know how I feel about cream cheese. This is 4 net carbs per serving. Low Carb Green Bean Casserole– Wine and heavy cream is a perfect match in this all real green bean casserole. Nothing canned about this casserole. Low Carb Green Bean Casserole– Just like like the one your mom always made but without the condensed soup. This is 5.3 net carbs per serving. Low Carb Green Bean Casserole– Xanthum gum is the key for getting the right consistency for the mushroom and onion gravy that coats all the green beans. This is 5.8 net carbs per serving. Low Carb Green Bean Casserole– Topped with battered and fried onion rings, not that canned stuff. This is 6 net carbs per serving. Add some extra flavor and options to your low carb Thanksgiving menu with some of these low carb side dish suggestions. 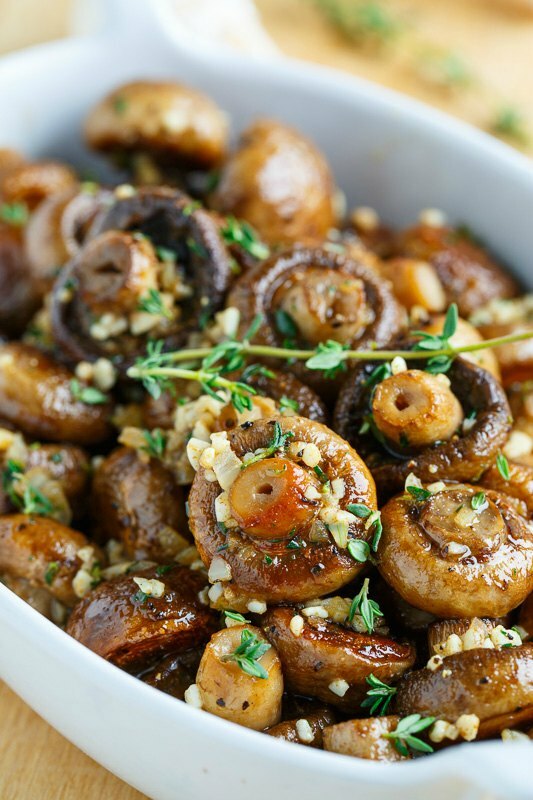 Roasted Mushrooms in Browned Butter, Garlic and Thyme (pictured above)- Super easy, just roast the mushrooms, brown some butter, throw in the garlic and thyme. Boom that easy! This is 3 net carbs. Low Carb Creamed Spinach– My all time favorite side. It’s all about the type of cheese you use. This is 4.2 net carbs per serving. Baked Zucchini Casserole– Not only is this yummy, it’s pretty too. This is 2 net carbs per serving. Finally, the best part of all, dessert! I’m one of those pumpkin latte haters but I like pumpkin desserts. Don’t try to understand it, I can’t understand it myself. Since there is such an overload of pumpkin flavored desserts during the holidays I couldn’t pass up sharing more than just pie. 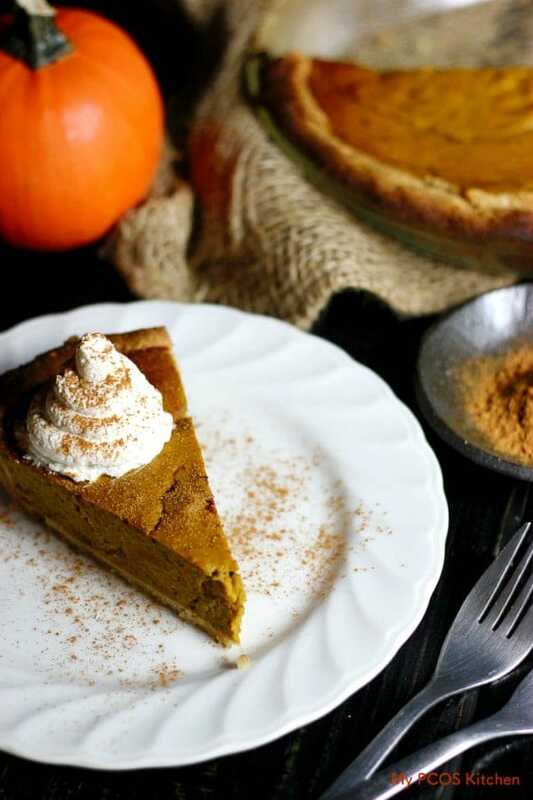 Paleo Pumpkin Pie (pictured above)- The low carb pie recipe is sweetened with Stevia and the crust is made with almond flour. This 7.5 net carbs per serving. Low Carb Pumpkin Chocolate Marbled Cheesecake– Rich and creamy low carb pumpkin cheesecake with swirls of chocolate cheesecake running through it, on a crunchy chocolate cookie crust. This is 6.5 net carbs per serving. Low Carb Pumpkin Slab Pie– This has a low carb shortbread crust. This is 4 net carbs per serving. Low Carb Pumpkin Cake Roll with Coffee Cream– Coffee whipped cream, mic drop! This is 3 net carbs per serving. Low Carb Slow Cooker Pumpkin Custard– Basically this is a pumpkin pie without the crust. This is 3 net carbs per serving. I saved the best for last and I can honestly say I have never tried anything with pecans I didn’t like. 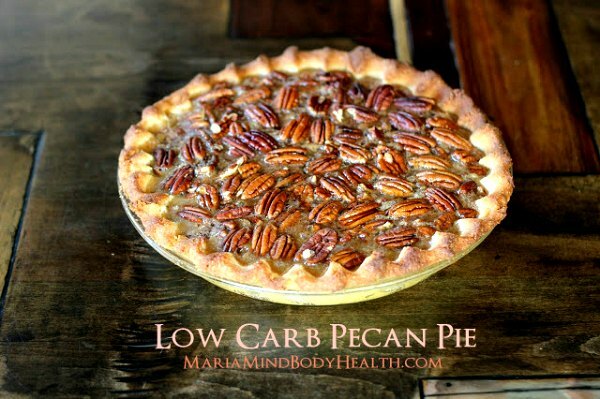 Low Carb Pecan Pie (picture above)- As close to a classic pecan pie as you’re going to get. This is 3.8 net carbs per serving. No Sugar Chocolate Pecan Pie– Dairy-free, grain-free, paleo and keto. Instead of using sugar to hold things together, zucchini is used. This is 3.2 net carbs per serving. Low Carb Pecan Bundt Cake– Tastes like pecan pie, eats like cake. This is 4.6 net carbs per serving. Low Carb Pecan Bars– Pecan pie topping over a buttery low carb shortbread crust. This is 4 net carbs per serving. Keto Pecan Pie– Coconut flour crust and sugar free maple syrup filling. This is 4.4 net carbs per serving. I hope these low carb recipes for Thanksgiving relieve some of the stress of trying to eat low carb during the holidays. This simple Thanksgiving menu proves that you don’t have to give up the things you love to stay on track! If you make any of the recipes, we’d love to here about it in the comments below. There are a ton of who eat low carb and rely on others reviewing recipes. We all know that some low carb recipes just don’t cut it. What a great recipe round-up! It’s so nice to see loads of options in one place. I’ll be trying some of these recipes for sure this year. I’ll be sharing this post! Can’t wait to cook all of Your recipes, they look and sound so good! !